Electric utility Con Edison is working to figure out what caused a high-voltage equipment failure that unleashed an otherworldly flash of bright blue light in the night sky over New York City Thursday, startling residents, plunging LaGuardia Airport into total darkness and inciting chatter about alien invasions. The flash lit the sky so brightly that it briefly appeared to be daytime in neighborhoods like Astoria and Woodside, residents reported. Smoke arose from the source of the blue light, visible from as far as Manhattan. No one was hurt. The event Thursday caused power outages, briefly grounded flights at LaGuardia Airport and filled social media feeds with eerie photos, questions and jokes, to the point that the NYPD tweeted there was "no evidence of extraterrestrial activity." And a jocular Gov. 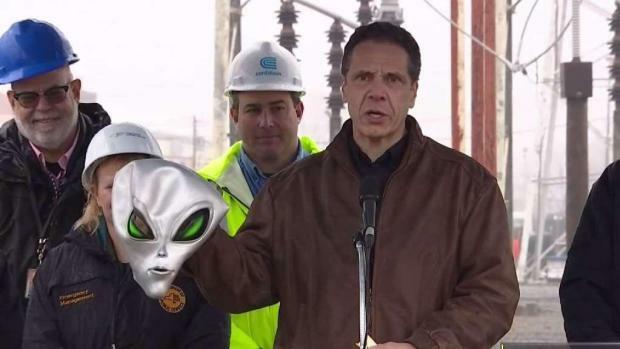 Andrew Cuomo pulled out a space-alien mask at a news conference Friday, while assuring the public that the incident "was what it was represented to be: an electrical malfunction." A day after a malfunction at the Con Edison plant in Queen cast a blue glow over the city, officials are explaining how the arc flash happened. Meanwhile, officials at LaGuardia Airport are explaining what happened during the power outage Thursday night. Chris Glorioso and Sarah Wallace report. While Con Ed initially described a "brief electrical fire" at a power substation in Astoria, spokesman Bob McGee said Friday that what happened was an electrical flash after a malfunction involving 20-foot-high equipment with cables carrying 138,000 volts. By comparison, a standard U.S. household gets 120-volt service. "It was like a lightning bolt, essentially," McGee said. Substations transform electricity that comes in from power plants at high voltage down to lower voltage levels, and send it on for use. Thursday's malfunction involved voltage-monitoring equipment, Con Ed said. Normally, a circuit-breaker-like device intervenes and quickly cuts off power to the affected equipment if there's an electrical fault, but that apparently didn't happen Thursday, McGee said. Instead, the electricity kept cycling through, causing the flash. "It did create a spectacular effect on the sky, and certainly caused a lot of concern," McGee told News 4, calling it an "abnormal event." 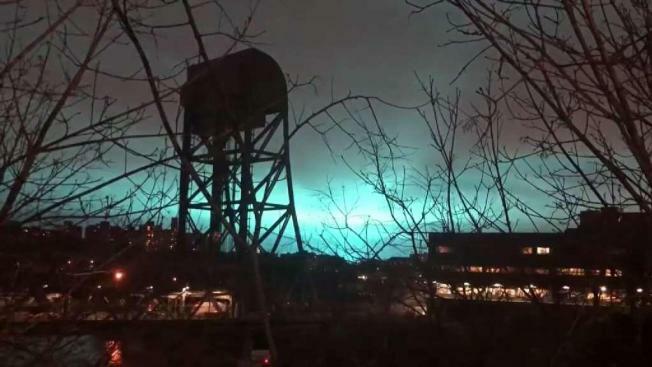 Electric utility Con Edison was working Friday to figure out what caused a high-voltage equipment failure that unleashed an otherworldly flash of bright blue light in the night sky over New York City. Tracie Strahan reports. Though the effect on equipment was small, the impact of the flash was huge citywide. Though small, the fire had a large impact citywide. LaGuardia Airport went dark, Rikers Island jail was on backup generators, and the 7 subway line saw major delays in both directions, according to Con Edison. 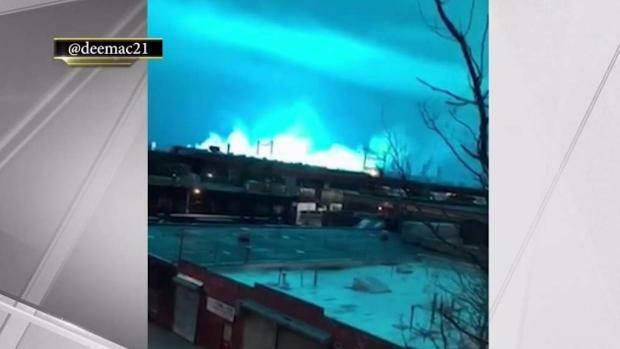 People flooded the streets in Queens and swarmed social media to try to figure out the source of the mysterious blue-green glow in the sky. "I was thinking this is the end of the world, like something's gonna happen," said Tarek Kherifi in Astoria. "The electricity went off, that was obvious. But the light in the sky, that was very intense," said Berklis Kanaris. "The combination made me wonder what it was." One boy told News 4 he thought it was a UFO. Onlookers invoked supernatural and sci-fi screen classics - "Ghostbusters," ''Independence Day," ''Close Encounters of the Third Kind" and more. There were, of course, hashtags - including #alieninvasion - and a tongue-in-cheek take on a real scientific phenomenon: the "Astoria Borealis." The city's 911 system got over 3,200 calls in the half-hour including the flash, compared to 500 calls in the prior half-hour, NYPD Commissioner James O'Neill said. As for why the cyan sky: When electric charges move through air, the air gets superheated and glows blue, explains Eric O'Dea, of Boston's Museum of Science, which is known for generating indoor lightning bolts in its Theater of Electricity. It was the second major incident involving Con Edison in the last six months. In July, a steam pipe explosion spewed asbestos-laden vapor into the air in the Flatiron District, driving hundreds of people from their homes and businesses. Con Ed said it had restored all major transmission lines associated with the event and was in the process of investigating the cause of the failure.